It is a flightless rail that look like a chicken. This unusual species is endemic to the Tasmania State of Australia. They commonly inhabit in farmland, grassland and marshes. The Islands on Bass Strait (located between the Australian mainland and Tasmania) many of such suitable habitats. 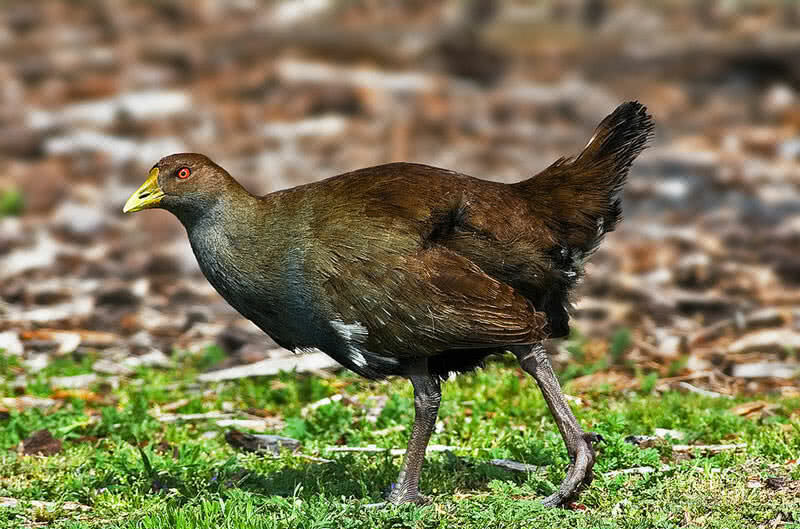 But, the colonies of Tasmanian native-hen can’t be found there as they are flightless. The heavy bodied native-hens have short wing. They live in small flocks. Despite being flightless, Tasmanian native-hens are good at swimming and running. They can run at a maximum speed of 30 miles per hour. native-hens use their short wings while running. Cassowary is a large flightless bird that native to wet tropical rainforests of Papua Guinea and Northeastern Australia. It is the second largest living bird in the world. They stand between 55-79 inches in height and weigh up to 58 kg. Cassowaries are famous for their strike blue plumage and red neck. They also have a beautiful horn like the crest on their head. This flightless, large bird has long enormously powerful legs with sharp claws. So they can defend any predator with a single kick. 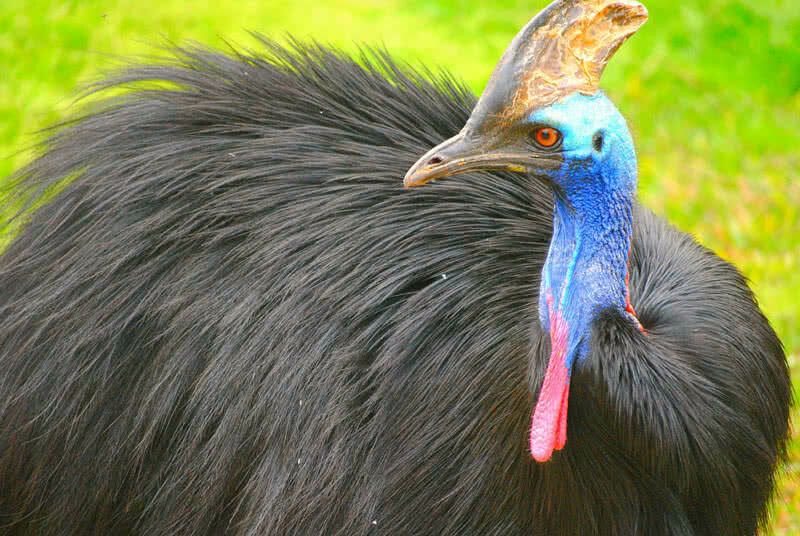 With the powerful legs, Cassowaries can also run up to a speed of 31 miles per hour. 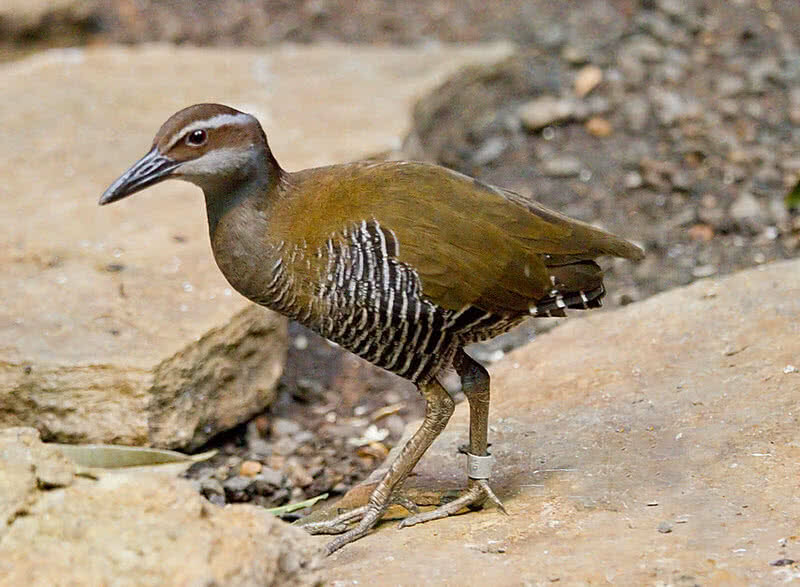 Inaccessible Island rail is the smallest flightless bird in the world. It only found on the inaccessible volcanic Island in Tristan archipelago, the most remote inhabited archipelago in the world. They live in grasslands and steep slopes. In fact, inaccessible rails can be found on almost all parts of the Island. Due to the extreme Isolation, there are no introduced predators on the Island where the Inaccessible Island Rails live. Thus, these flightless birds can fearlessly roam anywhere within the Island. The small inaccessible rail only measures up to 17 cm. in length. The are known for their rusty-brown plumage. They live in small groups and feed mainly berries, seeds and invertebrates. With a length up to 24 inches and weigh between 2.3-2.7 kg, the takahe is the largest member of rail bird family. They are endemic to Alpine grasslands of New Zealand. This unique bird has attractive green-blue plumage and large red bill. Compared to their heavy body, the wings are too short and can’t fly. 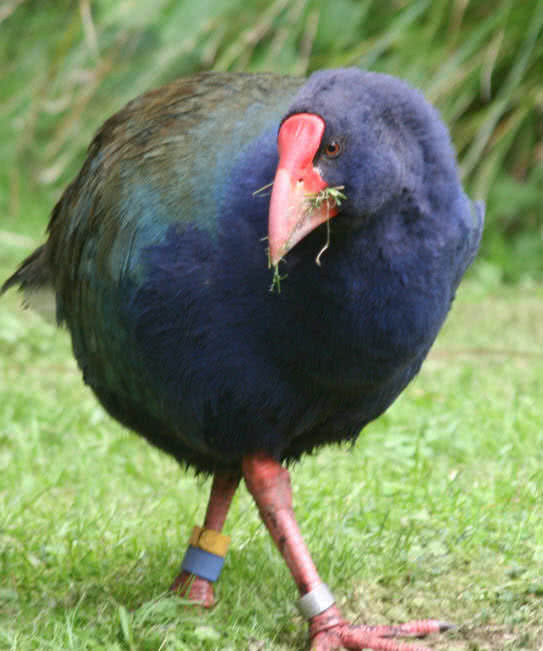 Takahes have a strong resemblance with common pukeko. But unlike pukekos, takahes are flightless. The wings of takahe are colorful, even though they are short. They use these wings during courtship to attract the female bird. Takahes were once thought to have been extinct. But they rediscover back in 1948. Still today only less than 300 Takahes live in the world and declared as one of critically endangered species by IUCN. It is a small flightless bird that endemic to U.S Island territory of Guam in the Marianas archipelago. They don’t have well developed flight muscles. Luckily, there are no natural predators on Guam Island to cause threats to this flightless bird. During 1970s, the population of Guam rails dropped from the Island with the introduction of brown tree snakes. But, many newly bred Guam rails have been reintroduced by the conservation scientists since 1995. For safety, scientists chose another called Rota in the Marianas archipelago. Flightless cormorant is the only species of cormorants that can’t fly. They live in the Galapagos Islands and found nowhere else in the world. 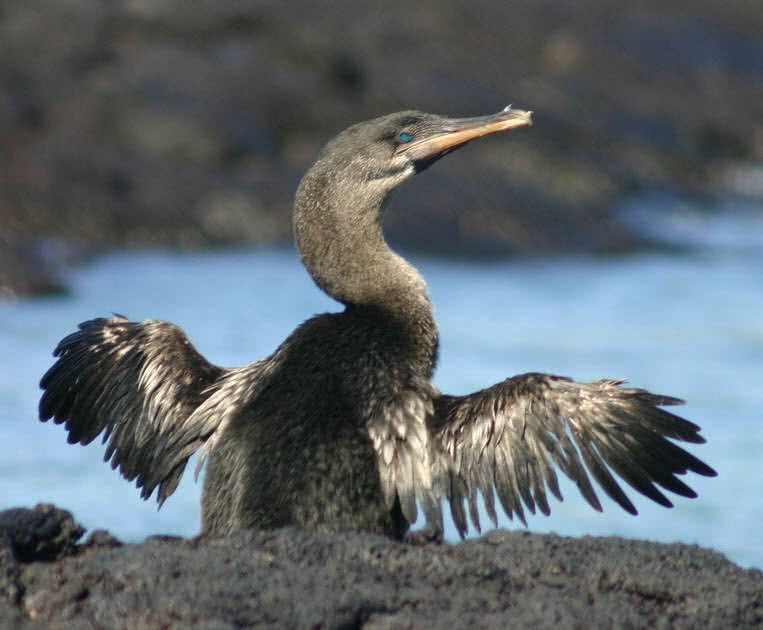 Flightless cormorants are also known as Galapagos cormorants. They only inhabit in Fernandina and Isabela Islands of Galapagos. Thankfully, flightless cormorants have no predators on these Islands. Flightless cormorants have a length between 34 inches and 39 inches and weigh up to 4 kg. Their wings measure one third of their total body length that would be enough for them to fly. It is believed be the long evolution of this species on isolated Islands with no predators result in loss of their ability to fly. 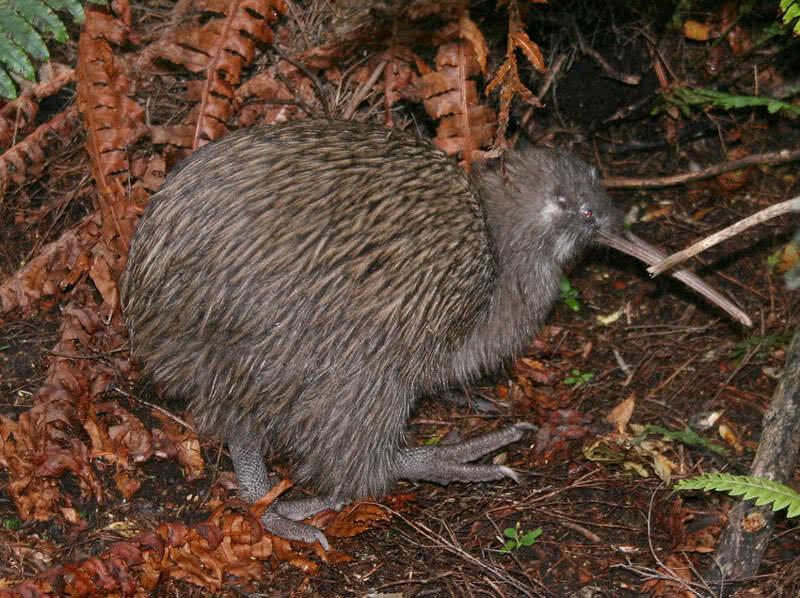 Kiwi is a small flightless bird that native to New Zealand. 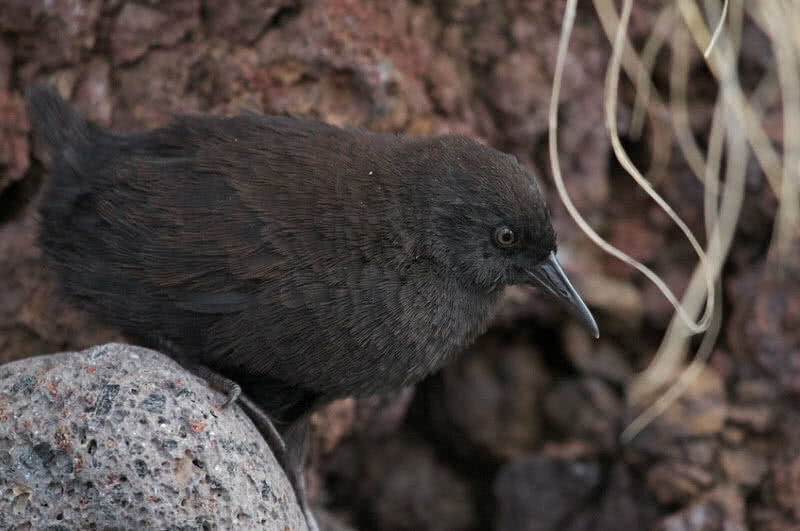 It is the smallest bird of all living ratites (family of non-flying birds) in the world. Kiwis only measure 20 inches in height and up to 2 pounds in weight. Kiwi is the national symbol of New Zealand. There are five species of Kiwis in New Zealand – Brown Kiwi, Little spotted Kiwi, Great spotted Kiwi, Rowi and Tokoeka. Sadly, all five species of Kiwis are endangered. The first species of Kiwis evolved over 8 million years ago. This Kiwi is one of the oldest birds in the world. It is still unclear that how the flightless Kiwis appeared on Island country New Zealand. Kiwis are so unique among the world of birds. Because they feature a number of mammal-like characteristics. 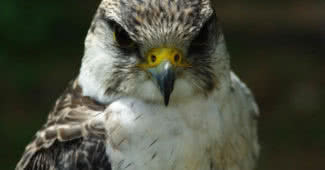 They have excellent sense of smell and hearing, hair-like plumage and dig burrows. Kiwis also have mammal-like body temperature, between 36 and 39 degree Celsius, which is lower than other birds. The flightless ostriches are the largest and heaviest living bird in the world. They stand up to 2 meters in height and weigh between 100 and 160 kg. Unlike flying birds, the breastbone of ostriches lack the keel which provides an attachment to wing muscles. Thus, their wings don’t get enough strength for making the flight. Ostriches are mainly inhabited in the savannas and desert lands of Africa. 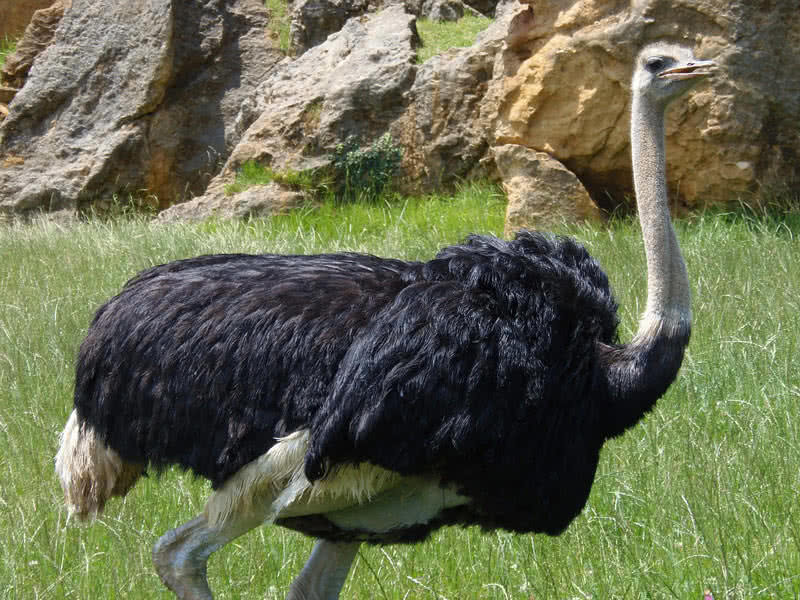 With long powerful legs, ostriches can reach a top speed of 41 miles per hour. Their two-toed foot have very sharp claws. Ostriches use their strong legs to defend against the predators. It is said to be one kick of an ostrich has enough strength to kill an adult human. 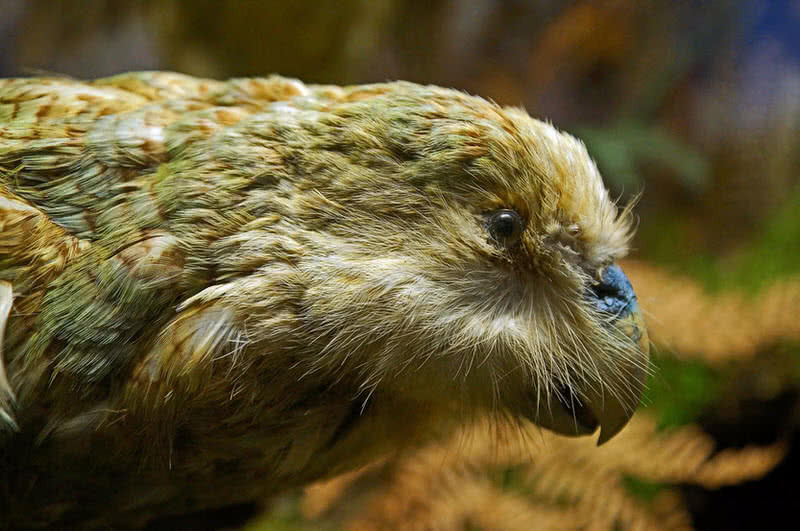 Kakapo is an unusual species of parrot that endemic to New Zealand. They are the only flightless and nocturnal parrot in the world. Kakapos are also the heaviest parrot in the world which weigh up to 4 kg. This large parrot has very short wings. In addition their feathers are much softer than other flying birds. So that kakapos don’t get enough strength for making the flight. Even though they are flightless, kakapos are excellent climbers. They can climb trees effortlessly. The yellow-green plumage of kakapo provide an excellent camouflage against the tree branches. Using this technique this nocturnal bird spend its day time on tree branches and only become active at night. Probably the most popular non-flying birds in the world. There are 17 species of penguins in the world and none has the ability to fly. Unlike flying birds, the wings of penguins are short and stout. Penguins use their short wings to flap through water rather than flying. Penguins are exclusively live in the Southern hemisphere. Antarctica is home to 8 species of penguins. The emperor penguin is the largest penguin in the world. They stand nearly 4 feet tall and weigh up to 35 kg. 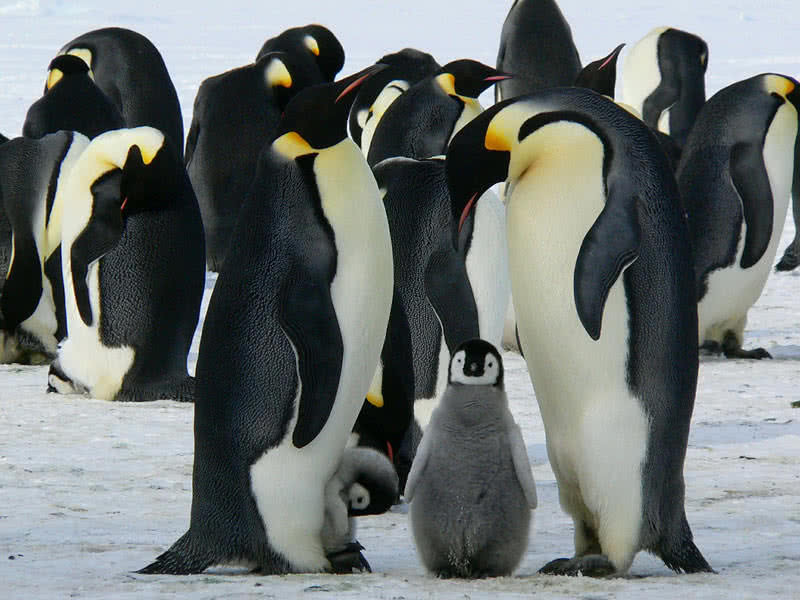 The emperor penguins are only found in Antarctica.